There is nothing worse than waking up to gather fresh eggs from your chicken coop, only to find the eggs or young chicks destroyed by a skunk. While skunks will kill young chickens and eat eggs, they rarely kill mature chickens. Because skunks are nocturnal, they can be hard to catch in the act of raiding the chicken coop. According to the Internet Center for Wildlife Control website, "unlike raccoons, skunks do not climb fencing; instead they prefer to dig under barriers to get to chicken eggs and chicks." Install chicken wire fencing that is at least 3 feet tall, around the entire chicken coop. Sink the bottom of the chicken wire fencing at least 1 1/2 to 2 feet underground to discourage skunks from digging under the wire fencing. Bend the bottom 6 inches of the chicken wire out away from the direction of the coop before burying underground. This discourages the skunk from trying to dig under the fence. Lock up and store any animal feeds that attract skunks, such as dog and cat food, away from the chicken coop. Close all trash lids tightly and do not store them near chicken coops. Skunks are attracted to the smell of trash. Remove any standing brush, old lumber or piles of trash that skunks can nest in. Initiate good rodent control practices near chicken coops and barns. 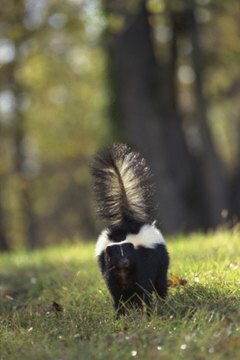 Skunks can be attracted to certain areas by smelling small rodents. Locating a dog or cat near your chicken coop can deter skunks and raccoons. Keeping lights on near a chicken coop can also help keep skunks and other predators at bay.